Always stop before entering the intersection. Yield just to the traffic on the right. Yield just to the traffic on the left. 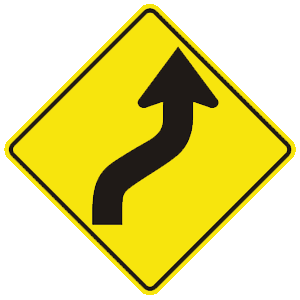 Slow down and yield the right-of-way to other traffic. 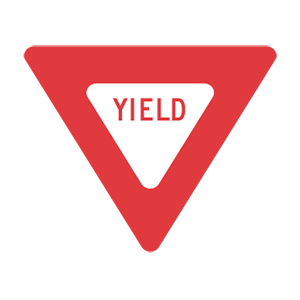 A yield sign means that you must slow down and yield the right-of-way to traffic in the intersection or roadway you are entering. Look in your rearview mirror for traffic behind you before changing lanes. Look over your left shoulder for traffic in your blind spot before changing lanes. Look in your side mirror for traffic and turn on your directional signal. Before changing lanes, you should always verify that there are no other vehicles in the lane you want to enter by checking your mirrors and looking over your shoulder in the direction you plan to move. You should signal every time you change lanes.